Google introduced the Assistant SDK back in April, making it possible for third parties to build the digital companion into their devices. Sure enough, at IFA 2017 in Berlin back in August, the first Google Assistant-enabled speakers were announced, due to hit the market this fall. There are now several different options from a range of manufacturers, and they cover various use cases and price points. Other Google Home alternatives with better speakers have also been announced by the likes of Sony and Panasonic. For those on a tighter budget there’s also the Zolo Mojo from Anker. And before that has even gone on sale, Google itself launched the Google Home Mini. Inevitably, there are also battery-powered alternatives you can take with you as you move from room to room. JBL offers two of these, with its Link 10 and Link 20 speakers costing $149.95 and $199.95 respectively. There is a cheaper alternative, however, and that’s the TicHome Mini from Mobvoi, priced at $99. Mobvoi has previous experience when it comes to building Google-powered hardware, as it recently launched two stylish looking Android Wear watches, the TicWatch S and E. The Chinese company had already worked on voice search technology with Google before that, so an Assistant-enabled speaker seemed a logical next step. The TicHome Mini can do practically anything Google Home can (just don’t ask about phone calls). While the MSRP is twice that of the Google Home Mini, if portability is your key consideration it could be worth stumping up the extra cash. 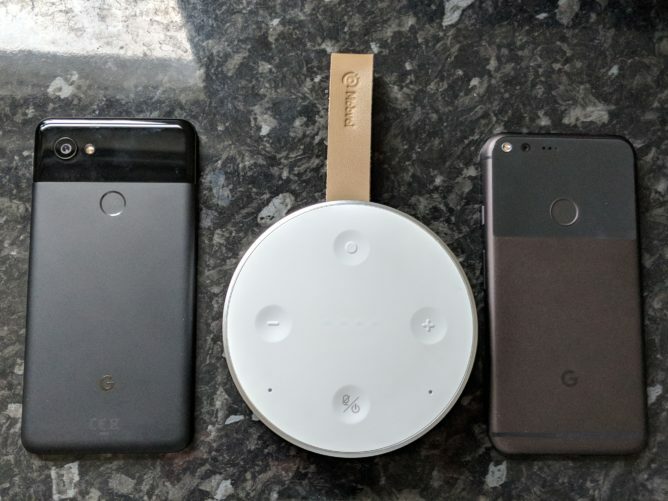 Next to a Pixel 2 XL and Pixel XL, for scale. Design Inoffensive design helps it blend in pretty much any surroundings, and the leather strap is ideal for quickly grabbing it as you move from room to room. Build quality Durable plastic will protect it as you haul it around, and it’s also splashproof. Audio I was genuinely surprised by how good the TicHome sounds, especially when you consider its small size and bottom-firing speaker. Battery Life It’s not terrible, but considering the key selling point of this product is portability I feel it should last a bit longer. Price It’s cheaper than the original Google Home and cheaper than other portable competitors, but you can get two Home Minis for the same price (three when there’s a deal). 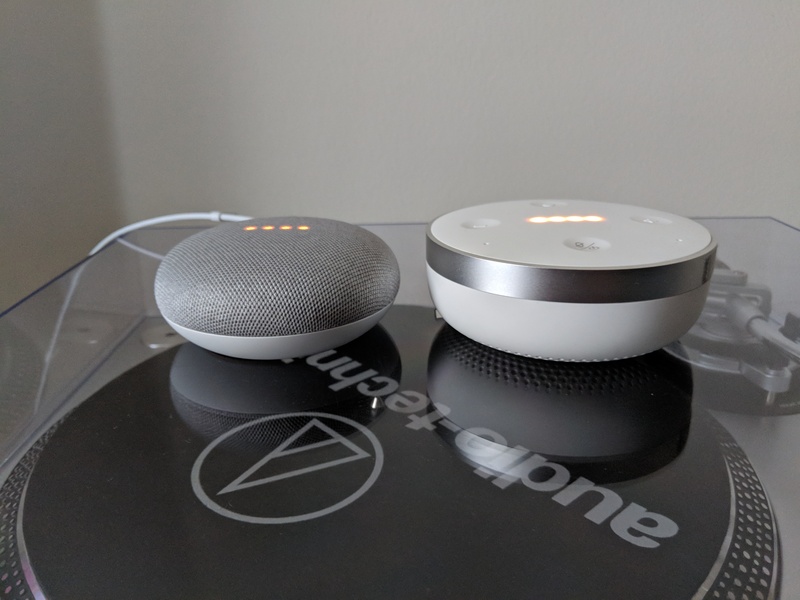 Next to a Google Home Mini, for scale. The hardware on the TicHome is a definite plus in my opinion. It feels relatively sturdy, despite its plastic construction, and has a satisfying weight to it without being too heavy to carry around the house with you. A rubberized bottom pad, similar to what you’d find on a Google Home, helps keep it steady when placed on a flat or slightly sloping surface, and that’s the best place for it due to the downward-firing speaker. This speaker probably won’t win any design awards, but it’s certainly inoffensive and tasteful, in any of the three colors that are currently on sale (White, Black, and Teal). The leather strap is a nice touch, echoing Google’s recent use of fabrics to give its hardware a more homely aesthetic and feeling. The strap is good looking but also very useful, making the device easier to grab as you head off someplace else. 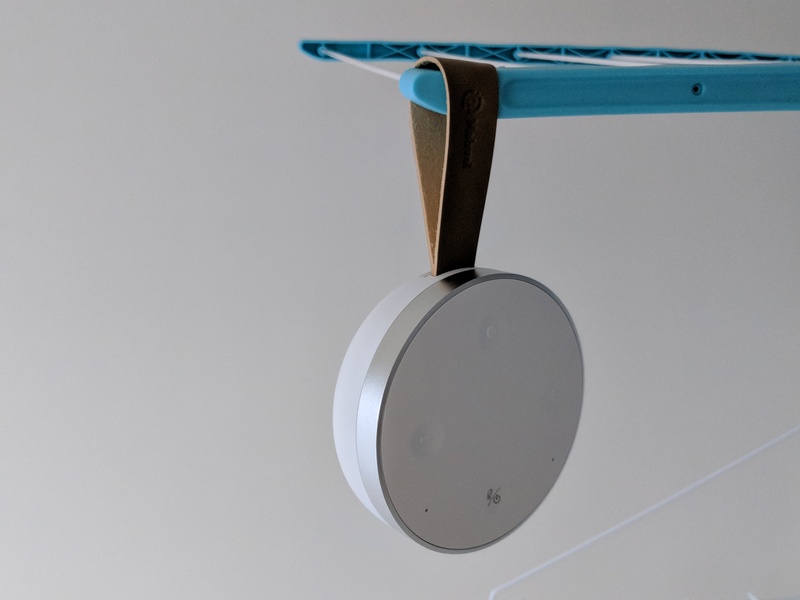 It can also be used to hang the speaker in a variety of locations, and it’s detachable if it gets in the way or if you’d prefer a more minimalist look. The leather used is of good quality, and will likely look even better with age. Thankfully the TicHome is IPX6 rated for ingress protection, which means it’s splashproof and can be used in the bathroom or kitchen without issue. The top of the device is where you’ll find the physical controls, which amount to four rubbery indented buttons arranged in a diamond. Volume down and up are on the left and right, with raised minus and plus symbols making them easy to distinguish without looking. The smooth button at the front functions as an on/off switch with a long press or a mute button with a short press. At the back is a button with a raised dot, and this is the action button that can be used to summon the Google Assistant with a long press. A short press can be used to dismiss an alarm or timer and pause or continue playing audio. I have no complaints about the button configuration or functionality; all works as you’d expect. 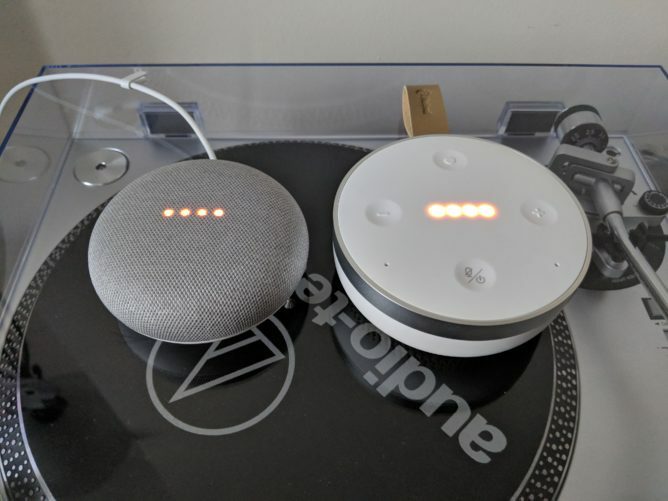 The center portion on top of the speaker is reserved for the four multicolor LEDs that have become synonymous with the Google Assistant brand. Just as with the Google Home Mini, the LED placement isn’t ideal. If the TicHome Mini is positioned on the other side of the room at head height, it’s pretty much impossible to see the lights. For example, if you’re on a couch and the speaker is on a shelf or desk. On the original Google Home, this is mitigated by the angled top panel on which its lights are located, which makes a lot of sense. 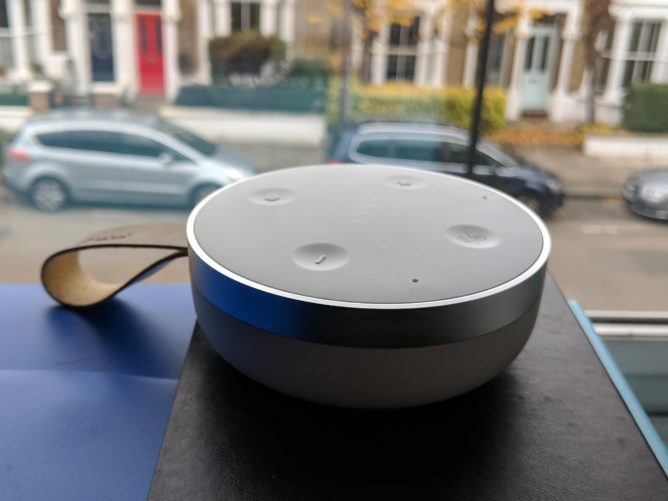 It’s important to be able to see the LEDs to be sure it has heard you when you bark an ‘OK Google’ command in its direction, as they’ll turn bright blue one by one to indicate the Assistant is listening. I definitely found myself straining or getting up in order to get a better look. First world problems, I know, but others (such as the JBL Link range) get it right and put the lights in a more prominent forward-facing position. Two pinhole microphones can be found below the volume buttons on either side, towards the front of the device, and the grill for the bottom-firing speaker is on the bottom surrounding the rubber base. In the box, you’ll find just the usual documentation and a 60cm USB-A to MicroUSB charging cable. The cable could be longer, and it’s a shame that it isn’t USB-C. Neither is the Google Home Mini, but you aren't expected to move that around quite so much. A reversible Type-C port would make more sense here. The TicHome Mini is one of the first third-party speakers to have the Google Assistant built-in. If you’ve already used a Google Home device, there is no difference in functionality except for one thing: you can't make phone calls (for now). That may be a deal-breaker for some people, but it doesn’t bother me. As with Google’s smart speakers, the TicHome Mini can be controlled using the Google Home app and can be added to speaker groups in the same way. 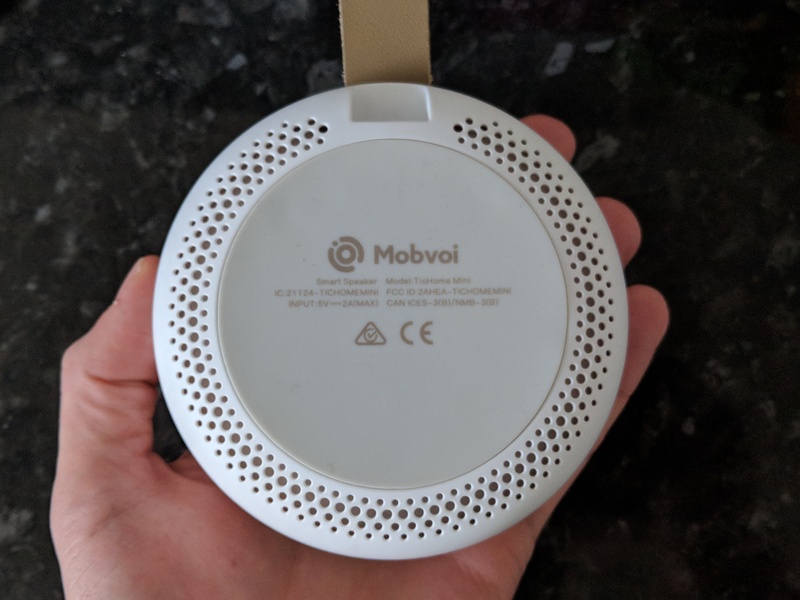 All of the same smart home products that you already use with Google Home will work with Mobvoi’s offering, too. Interacting with the Assistant on the TicHome Mini works as well as you might expect. The dual microphones picked up my voice well from across the room, even with music playing at a moderate volume. You will have to raise your voice if you’re listening to something louder, but there’s not much that can be done to temper that. If there’s one advantage of the sound coming from the bottom of the device, it could be that the mics on top are less affected. As well as being able to ask the Assistant to perform a bunch of functions, including playing music from services like Spotify and Play Music, you can also bypass the Assistant and simply cast media to the TicHome Mini. As long as you’re still in range of your Wi-Fi, this will even work outside. And if you stay too far from the router, there’s also the option to connect via Bluetooth 4.2. This means you can use it as a truly portable speaker, and there’s also an NFC chip on board for easy pairing. One misstep for a device that touts portability as a major selling point is that you can’t easily change from one Wi-Fi network to another. Doing so means you have to set the speaker up entirely from scratch, which is a pain if you just want to take it to a friend’s house for a little while and then bring it back. 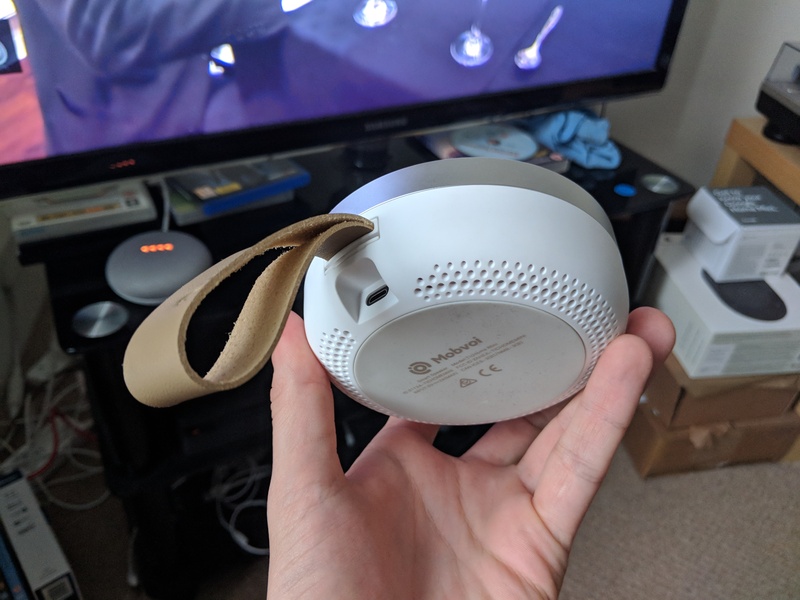 I guess you could just use it as a Bluetooth speaker only while not at home, but it’s still a bit annoying to not get its full potential without going through the setup rigmarole over and over. 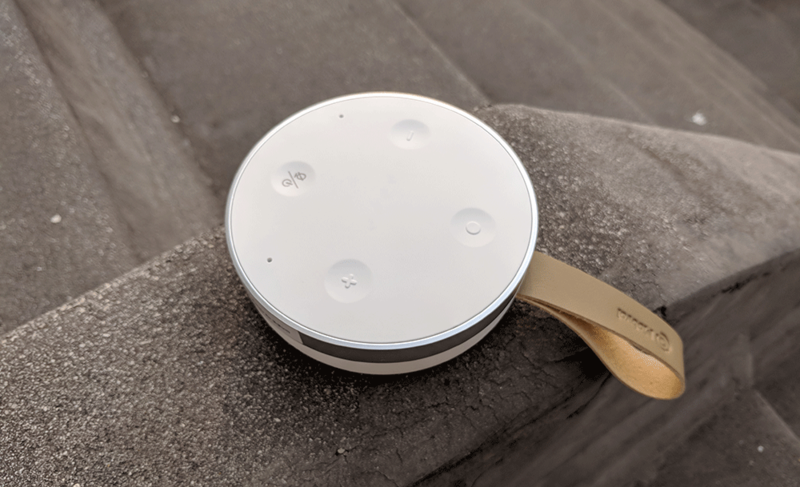 Granted, this isn't Mobvoi's fault because that's how Chromecast and Assistant speakers work and it falls on Google to enable multiple Wi-Fi network support, but it's still a disadvantage for the TicHome Mini if you are planning on buying it now. Regardless of its Google Assistant smarts, the TicHome Mini is still just a speaker in essence, and therefore sound quality remains an important factor. This is an area where the product doesn’t excel, but it by no means does badly. The 3W speaker, as previously mentioned, fires downwards. This is fine in most situations when you place it on a flat surface, but results are obviously more mixed when it’s on a bed or hanging up somewhere. At its best, the TicHome Mini speaker compares favorably with the Google Home Mini. It’s a little tinny, sure, and it distorts at high volume. But it gets pretty loud, and there’s a surprisingly good amount of bass for its size and price. Other dedicated Bluetooth speakers in this price range will inevitably sound better, but they won’t have the Google Assistant or casting, so it really depends on what your priorities are. Of almost equal importance with how the device sounds is how long it can last on a single charge. It’s supposed to be portable, after all. According to Mobvoi, the 2,600mAh battery should correspond to a 6 hour standby time or 2 hours of continuous music playback. I can say that results were inconsistent for me, and I probably didn’t quite get up to those numbers. It’s important to note that my TicHome Mini is a pre-production model, and I was warned that the battery might not charge and discharge as it should. Whether my device was affected is difficult to say, but I would hope that final units can last a little longer. Another battery-related issue is how you are notified when it’s low on juice. You can’t ask the Assistant for the battery level (Google would need to add this functionality) and you can’t find out through the Home app. The only low battery warning you get is a single yellow blinking LED on the top, but by that point you have almost no time at all until it needs to be plugged in or just shuts off. That’s probably my biggest gripe with the TicHome Mini, but at least it’s one that could be addressed in a future firmware update. Ultimately, the decision is entirely subjective and depends on what each potential buyer values the most. If you just want a small smart speaker and you don’t want to spend too much money on it, go for the Google Home Mini. If you want a portable Assistant-powered speaker and you don’t mind parting with the extra cash, absolutely go for the TicHome Mini. It's not perfect, but it gets the job done. Note: With Black Friday upon us it’s worth noting that the TicHome Mini is being discounted by 40% to $60, although that's not including shipping and taxes. There are also Black Friday deals for the Google Home Mini, with many retailers offering it for just $29. The Google Store and others are also offering an additional $10 in store credit, which effectively makes the device as cheap as $19.